Thirty-five metres long and fifteen wide, these are the measurements of this large catamaran by the French shipyard Sunreef Yachts. Its really amazing feature is the beam, which improves not only sailing quality by offering considerable stability but also the quality of life on board, thanks to the added comfort of the large areas available inside. The Sunreef 115, cutting edge model for the "cruising" range of catamarans the yard offers, is produced with two different layouts. The first version gives more importance to the sleeping area, comprising no less than six double suites, of which one is the owner's and two cabins with bunk-beds for the four crew members. Each cabin has its own private bathroom. The wardroom offers a total of six sofas purely for relaxation, a large central dining table for ten and a bar corner to port, which is interrupted by the glass door to the stern and then continues symmetrically outside. One of the two galleys is located in the living area, while the other is to be found on the port hull, accompanied by a dining corner with table and L-shaped sofa. The command station is in the bows of the deckhouse and is equipped with a central bridge and seating for the pilot and co-pilot. 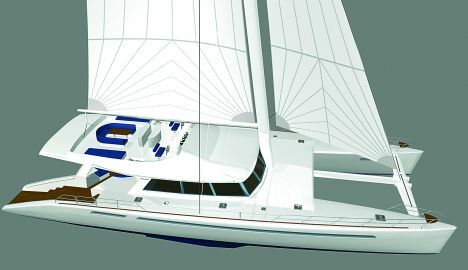 The cockpit is given over to relaxation in the open air and offers a C-shaped sofa and cocktail tables, an L-shaped sofa with table to starboard and cocktail cabinet on the opposite side. The sundeck hosts the external wheelhouse and a roomy cushioned sunbathing area. The layout second option has been designed to offer more space for the already generous internal living area, with the galley area completely re-worked. The double suites are still six, with the owner's suite larger this time and equipped with a separate bathroom that takes the place of the one of the two crew cabins. For further information: Sunreef Yachts; 145 rue de l'Ile Napoléon; 68100 Mulhouse; Francia; tel. 00 33 (0)3 89311474; fax 00 33 (0)3 89311477; website www.sunreef-yachts.com; e mail info@sunreef-yachts.com.